Colored Nylon Zip Ties | Fluorescent Cable Ties | Cal Fasteners, Inc.
For color coding, easy visual identification, packaging continuity, and/or aesthetic purposes, Cal Fasteners carries high quality nylon zip ties in a range of standard and fluorescent colors. Available in numerous lengths and widths to meet your requirements. 18, 40, 50, and 120-pound capacities available. Finger grips and tapered tails allow for fast handling, alignment, and tightening. Low insertion and pull through force make installation easy. One-piece construction and unique pawl, teeth, and transition rail designs give these colored cable ties high tensile strength and durability. ROHS compliant. We also offer 18, 40, 50, and 120-pound zip ties in natural and specially-treated black nylon varieties. 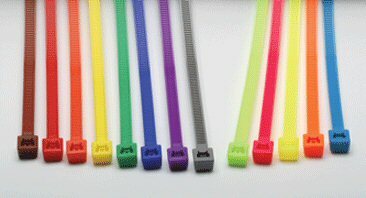 Request a quote on the colored cable ties you need, or contact Cal Fasteners to learn more.